Colome, rated No. 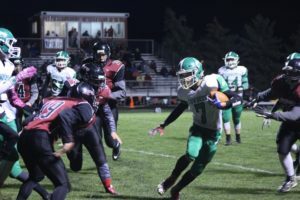 2 in Class 9B football, rolled to a 60-8 victory over Corsica-Stickney on Friday. With the victory, Colome remains undefeated with a 7-0 record. Jackson Kinzer led Colome’s rushing attack with 197 yards and four touchdowns. In the second quarter, Kinzer scored on a 51 yard run, Kinzer on a 41 yard run and Chase Dufek on a 9 yard run. In the third quarter, Riley Shippy scored on a 1 yard run and the final score was Shippy on a 5 yard run. Shippy had 52 yards rushing. Beau Bertram and Wyatt Cahoy each had seven tackles for Colome. Colome will host Avon on Friday.